We are moving into true November weather now, with cooler days and leaves tumbling down. I'll have to move our little space heater from the garage to our enclosed porch, where I love to work. 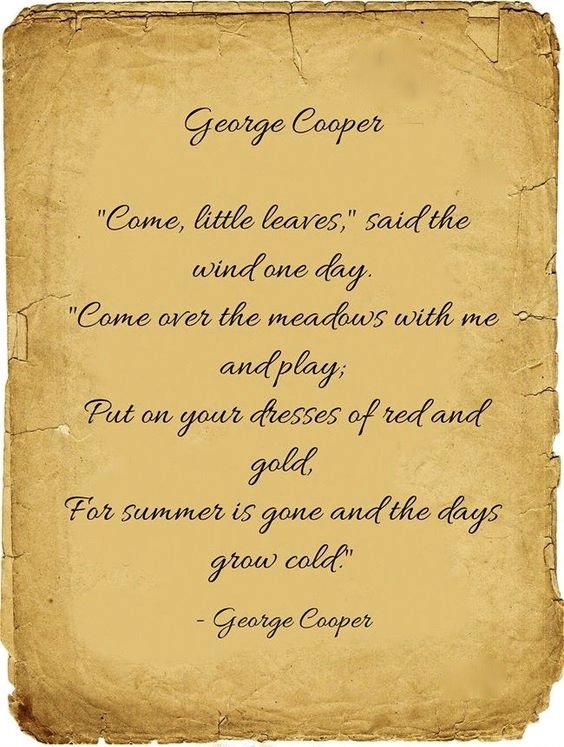 I found this sweet poem on Pinterest, which brings some whimsy to the leaves we'll soon be raking! I've been working on my fabric weaving and I'm declaring it done for the moment. I may tweak a thing or two, but I'm happy with it. Something totally different for me! I can see myself doing more! So, on to a new project! I have something definite in mind. Can't wait to get started tomorrow! Our crazy wind storm last weekend took nearly every leaf off of every tree and blew them all up the ridge, leaving very little for us to rake! Your weaving is very pretty, Judy. It's so nice to meet new people during this challenge! And it's even nicer if they turn out to be autumn and poetry lovers too! Here in Belgium, the weather is changing too, wind and rain... I love how everything seems to be calming down and resting its head when fall season peeps around the corner. 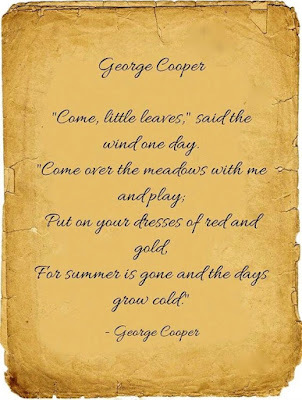 It's all captured in that slow movement of a golden autumn leaf swirling down from treetop to fragrant earth. I feel like I can move to a calmer place inside myself too. I love how you create everything with fabric. I ocassionally sew here and there (by chance coincidence I was sewing today for AEDM!) but that is totally different, you approach the fabric as an art material. I love it! I'll surely be dropping by during this beautiful November month! Love this beautiful fabric weaving! Thank you for stopping by Feeling Stitchy and leaving a comment! Art Every Day Month and Happy November!